While many garden poppy varieties are tender perennials, they are grown as an annual since they don't survive winter freezing. Harvesting the poppy seeds allows you to replant your favorite varieties each spring without having to purchase new seeds. Poppy seeds, such as those harvested from oriental poppies, are also used to flavor a variety of baked goods. Each poppy flower produces hundreds of small, black seeds, so you don't need many flowers to harvest a bounty of seeds. Pick the poppy flowers when the flower petals begin withering and dying back and the seed pod becomes swollen and visible under the petals. Leave two inches of stem attached when cutting the seed head. Spread the poppy seed heads out on newspaper in a warm, dry room. Leave the seed heads to dry for one to two weeks, or until the seeds begin rattling inside the pods. Pull open the seed pod and shake out the small, black seeds into a bowl. Alternately, poke a hole in the top of the pod with the tip of a knife then shake out the small seeds. Place the seeds inside a plastic self-sealing bag or into a jar that has a tight-fitting lid. Label the bag or jar with the poppy variety and year harvested. Store the seeds in a cool, dry area until you are ready to replant or use them. A refrigerator, unheated basement or potting shed are optimal for seed storage. The common poppies grown in gardens are not the same type as those grown for opium. 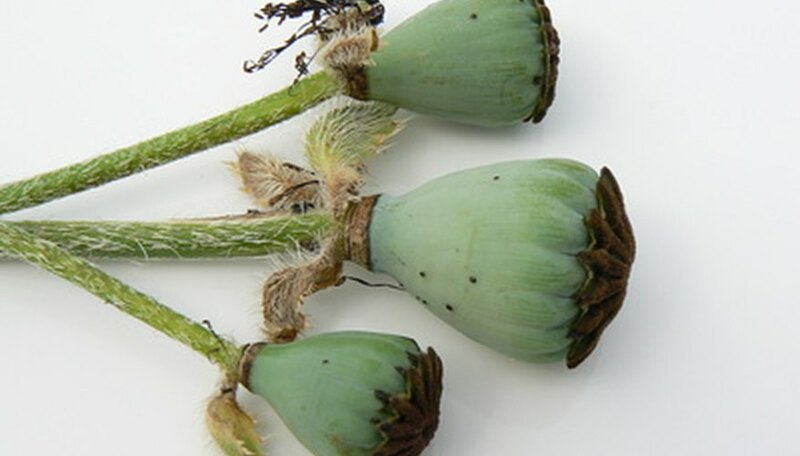 Most commercial bakeries use seeds from opium-poppy varieties, but these are not grown in home gardens. Rodents and other pests will eat your seeds if they can access them. Store in a jar if rodents are an issue.